The timing of The PPAI Expo and SAGE Conference couldn’t be better. It’s a fresh start to a new year and you get the chance to focus on yourself, your business, and the new goals you’d like to achieve. The sessions of SAGE Conference are tailored toward addressing some of the biggest obstacles you face on a daily basis. 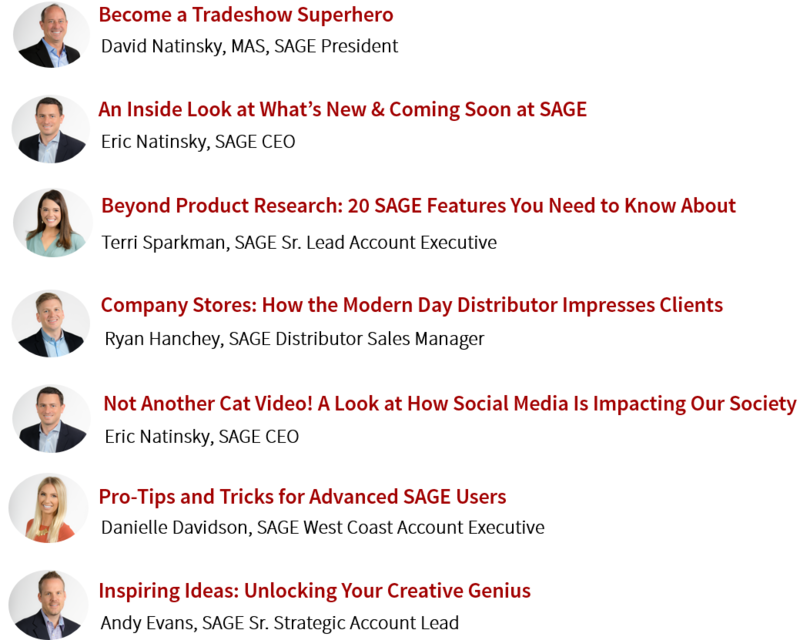 One of the most anticipated sessions each year is the Inside Look at What’s New and Coming Soon at SAGE. SAGE CEO Eric Natinsky took the stage last year to unveil SAGE Mobile 6.0 and major updates to our web-based platform, SAGE Web. This year, we are SO excited to reveal some new product updates and enhancements that will change the way you do business! Each new feature is truly designed with you in mind. We take the feedback we receive at SAGE Conference and throughout the year, and make sure our solutions are solving problems you are running into. You’ll get some great insights and tutorials during the sessions, but you may still have some questions for us. Feel free to stop by the SAGE Answer Station, our product support room, and get some hands-on training and in-depth answers from one of our SAGE experts. No question is too hard for our experts – they’ll walk you through anything you’d like to know about SAGE Online, SAGE Web, SAGE Mobile, or any of our products! No appointment is necessary. The SAGE Answer Station will provide free, first-come, first-served assistance to distributors. With 800 people in attendance last year, we’re already anticipating an even larger crowd this year – making this the largest conference in our industry’s history! That calls for a celebration. You’ll spend the day surrounded by other industry professionals and be able to make those vital connections that help you succeed! It’s important to meet like-minded individuals to bounce ideas off of and share advice to keep our industry thriving. SAGE Conference is a prime opportunity to network and interact in a fun atmosphere! You’ll also hear from two of the industry’s top suppliers about their business processes and see their latest products for the new year! We can’t wait to see you at SAGE Conference 2018! As always, SAGE Conference is free to attend! Just be sure to secure your spot today!